… this project… is a fabulous stash buster as you only need the smallest scraps of left overs. You can mix any colours that tickle your fancy (I’ve gone for five candy-brights, with two shades of green for the leaves). Any sort of yarn will do, it doesn’t have to be cotton. Thickness wise, I think slightly finer yarns work best for small decorative projects. I’ve used Drops Muskat (a mercerised cotton) with a 3mm hook. 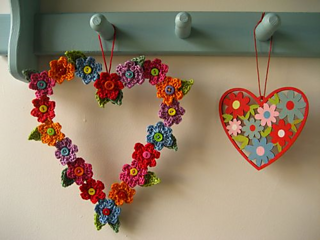 If you’re using something like Stylecraft Special DK, try dropping to a 3.5mm hook to make the flowers nice and neat.